Cette magnifique trousse offerte pour tout achat ! This magnificient small case is free with your order ! The pattern comes from the "lady and Unicorn" serie. 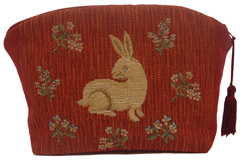 Cover size : about 20 x 14 cm.